The CUZ, the LARGEST BBQ PIT in the WORLD! Bud Liffick (center) builder and owner of the CUZ. Celebrating on top of the CUZ with excited Marines after dinner! 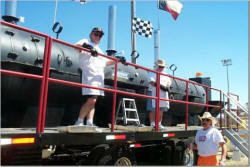 Dan Cannon, Mike Guinaugh, & Bud Liffick manning his pit, the CUZ, the largest in the World! 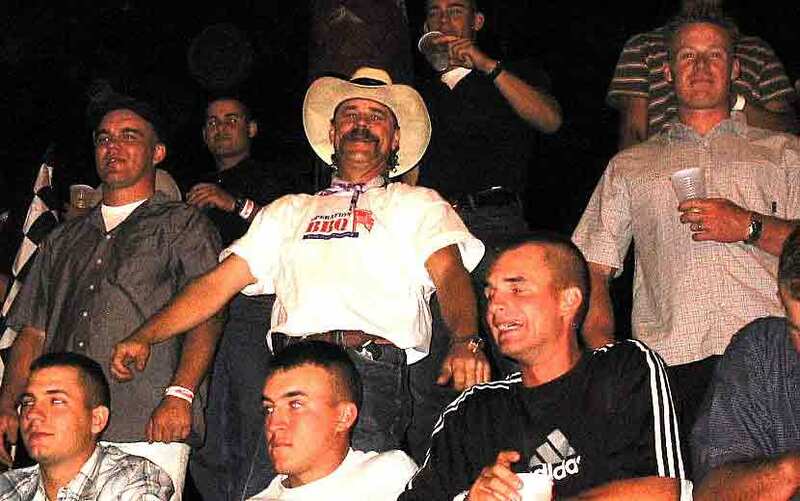 Since I write most of the articles for my two websites and post so much opinion I felt the following document consisting of the media and other folks input might better reflect what really went on at the Twentynine Palms Marine Base " Welcome Home Party". I had a great time and got a lot of enjoyment and reward out of my attendance. I did less than some and more than others. However, I was very proud to be a part of what everybody collectively accomplished and feel that it was a mission well done by our team. Bill Wight's project management and Don Grissom's salesmanship skills were the required contributing factors that made this event happen. And, this event was VERY successful. You may be a fierce supporter of the U.S. invasion of Iraq, or an obdurate opponent. Perhaps you are angry because you think President Bush exaggerated the need to act swiftly and unilaterally. Or because the Democrats seem to be bashing him purely for political gain. But one thing is beyond dispute: Our troops, who did not ask to be there and probably wish they weren't, performed brilliantly in a strange, hostile, dangerous land, half-a-planet away. Those heroes deserve our sharpest, snappiest Uncle Sam salute for forfeiting an unrecoverable chunk of their lives. Plus an Old Glory hug to their families, both those who will see their loved ones again and those who, sadly, won't. To say thanks and welcome home, a great bunch of people threw the mother of all barbecues Saturday -- but the fare was not burgers and the venue not an umbrella-shaded patio. Rather, it was a feast of Brobdingnagian proportions, 3.5 tons of smoked meat. And the "backyard" was Twentynine Palms, Calif., to honor all the veterans from the world's largest Marine Corps base who saw duty in Iraq. 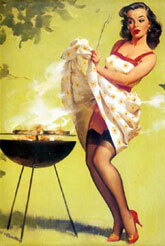 Welcome to OBBQFOT-- Operation BBQ For Our Troops. Brisket. Chopped pork shoulder. Chicken legs and breasts. Beef ribs. Turkey. Sausage. Slow-smoked to mouth-watering perfection. 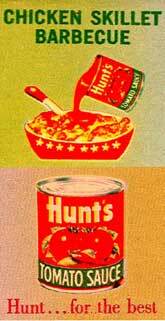 Tubs of slaw and macaroni salad and potato salad, beer and soda, gallons of sauce for homesick Leathernecks to slather on their tasty morsels. 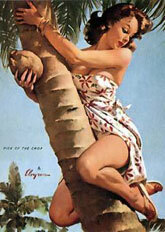 Organizers said more than 7,000 showed up for the tummy extender in perfect Southern California desert sunshine. And 'cue aficionados BBQ teams, judges and just plain enthusiasts and volunteers from as far as Tennessee -- slow-smoked the meat over aromatic wood fires and piled on the trimmin's in a giant, All-American thank-you. Professional teams with colorful names like Dueling Bubbas and Coyote Road Kill, regular participants in some of the dozens of weekend competitions across America, smoked donated meat over hickory and mesquite. Refrigeration trucks were donated, as well as paper plates, utensils, foil, serving pans, condiments, buns, desserts. 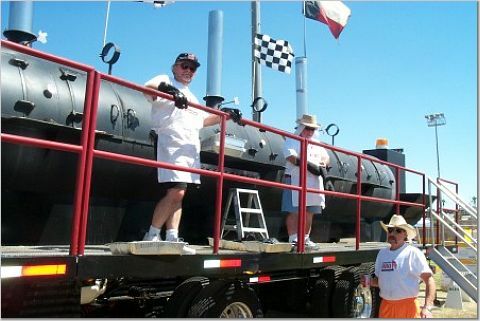 On hand was the world's largest mobile smoker, a 78-foot long steam engine called "Indisputable Cuz" from Houston that can smoke tons of meat at once. 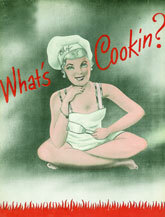 Plus eight smokers from around California capable of cooking enough goodies to serve anywhere between 100 and 2,000. Edward's Bakery in Atlanta sent 100 cases of individual slices of key lime and pecan pies, and cheesecake. A half-dozen California teams from the International Chili Society brewed 150 gallons of "red" with meat donated by the carpenters' union. Professional 'cue chefs arrived Friday afternoon to trim, cut and season the meat. 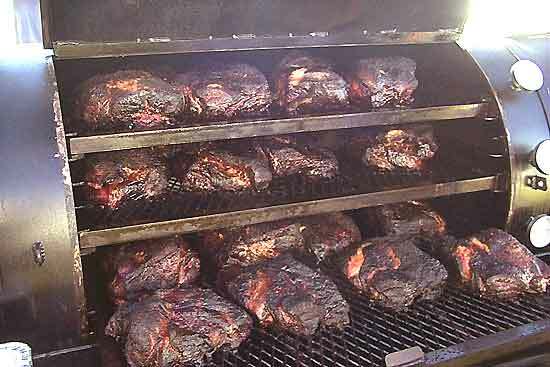 Briskets and pork shoulders smoldered merrily all night; ribs, chicken and turkey hit the grates Saturday morning. Marines began showing up at 1 p.m. to the wondrously named Victory Field, the size of adjacent football gridirons, to listen to live music. A jumbo screen showed a solemn video tribute to the 11 Marines from the base who won't be coming home. Serious eating began at 4:30. Bill Wight of Coyote Road Kill, a guiding force behind the party, vowed to serve until we run out of Marines and paper plates. That happened at 10 with the 11,000th plateful. Stragglers went home at 1 a.m. with plastic bags stuffed with leftovers. As befits a great idea, this one is spreading. 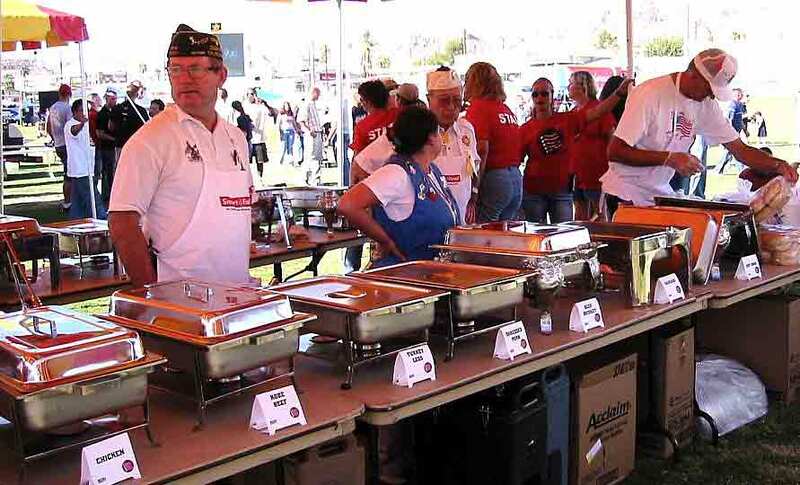 In May, also at Twentynine Palms, OBBQFOT fed families of the 1st Marine Corps Division with loved ones in Iraq. On June 7, at Camp Pendleton, Calif., OBBQFOT feted 1st Recon Marines who had returned just the day before. On July 24, 500 Delta Company Tracks Marines and their families got the 'cue salute at Twentynine Palms. Other fetes are on the drawing board. I am 72, and my brother was in the Marines and served in Vietnam. When he finally came home from the war, he was spit on at the airport. I don't want to ever let that happen again. They found a spot for her on the serving line. Sunday, September 21, 1700 hours. I feel like I just got back from a 50 mile forced march carrying 100 pounds of Edward's Key Lime Pies on my back. I hurt all over, and I'm sure I am not alone. But it's a good hurt. I have to say, that under any criteria, the Twentynine Palms Welcome Home Party barbecue was a 150% success. It was not a success because of Don Grissom, Del King and myself. It was a success because we pulled together as a team and made it happen. I want to thank everyone involved for working so hard and doing so much to make this barbecue happen. The volunteers who showed up for the event worked until they were ready to drop and then somehow found the energy to work for several more hours. You were amazing. We OBBQFOT guys and gals had incredible support from several ROTC students from Long Beach, the Southern California VFW guys and gals and California Carpenter's Union people. The folks in MCCS gave us great support in pulling off this event. For the CBBQA people who did not get out to the Twentynine Palms WHP to help, you truly missed an event of a lifetime--being part of the biggest authentic wood-smoked barbecue in California history, cooking on the world's largest mobile smoker and the chance to honor some of the best people in the world, the US Marines of MCAGCC Twentynine Palms. I have received several estimates of the WHP barbecue attendance and they vary from 6,000 to 12,000 people served. We started the serving operation at 4:30 PM with10,000 dinner plates and somewhere around 9:45 we ran out of plates. Gene Goycochea came up with about 400 plates and we ran out again. The MCCS people found another 800 and we used most of those. So it looks like we passed out over 11,000 plates. Granted, some portion of the Marines coming through the lines filled two plates and some came back for seconds and maybe even thirds, but I estimate we served 7,500 people. I know what we accomplished yesterday was really appreciated. But we did not do this to be appreciated, we did it to honor those who went away from family, loved ones and home and put their lives on the line for us and this great country. About 9 PM, we were honored when General Cowdrey, the base Commanding General, asked Don, Del and myself up on the stage. He presented to OBBQFOT a framed copy of the MCAGCC mural with an engraved plaque thanking us. I asked Del King if he would keep it for us and I thought I saw a tear in that tough ex-Marine's eyes. Later that evening, as I was handing out the donated BBQ'N Fools sauces, a young Marine wife came up to me. She reached over the table, grasped my hand in hers and said with tears in her eyes, "I remember you from the May 17th event. 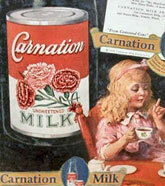 I took a bottle of this sauce then and I wrote my husband in Iraq what you people did for us. I told him I was not going to open this sauce until he came home." With tears in my eyes, I gave her another bottle and said, "This one's for you." She came around the table and gave me a big hug. What greater thanks could anyone ever get then this. So, to all those of you who baked and ached your bodies in the desert sun and then far into the night, I say, "Job well done." You and your crew were, I hate to keep using this word, awesome. If just a single one of the large pits had not made it, we would have been in trouble. I can't thank you, Rick Mackenzie, James Lyons, Jacque Moreno, enough for all the work you guys put out last weekend. I hope you can join us again for another OBBQFOT event. Every time I asked one of your team to help me or assist someone with a problem, you guys did it w/o blinking an eye. As for accepting you and your team, that was real easy to do. My only regret about last weekend is that I did not get to spend any time getting to know the new people who joined us. So please, when we have our next Q-Fest (a barbecue get-together in a campground for a weekend) join us and we can all swap some tales. I am so glad that you and David were able to rearrange your schedule after I asked you if you could come out to 29 Palms as a reserve cooker if we could not get the Cuz into CA. With Bud not wanting us to cook chicken and sausage in the Cuz, it was your team that put us over the edge and won the battle of legs and breasts. We hope that you and David do join us in future BBQ cook-offs and events. You and David are a class act. Frank's buddy is Ed but I forgot his last name. I really don't know why, as I had so little going on this last weekend. Remember, I will be going to the Royal and getting ready all this week. I am going to have to take a pass on the article and managing the photos until I get back on Oct 9th. So if you want it done earlier, I suggest Bill Stadler and Pam Gram be assigned the task. Franco called me this morning to say what an honor it was for him and Ed to have participated in the MCAGCC WHP and he congratulated us on doing such a great job. He said the barbecue was extremely well executed and coming from him, a true Bbq catering professional, I take that as a real compliment. He's up for more OBBQFOT events with us. Franco is on his way to Montana to help a friend open a new restaurant. Ben Larimer and his friend and pastor Tim Moore drove all the way from Redding CA to help us put on the WHP. Ben donated the pails of BBQ sauce (his own sauce recipe) and the hot dogs. You did not see him at dinner Friday night because he and Tim were so tired after the 12 hour-all night drive, they had to go to the hotel room and crash for a few hours. To all those that participated in one way or another, your hard work was worth it. It felt great to work with other great people in a common bond assisting our troops. We worked, laughed and toiled together in an event we will always remember. Continued success in future endeavors. I thank all of you for readily accepting us. We tried to assist where needed. I have not been able to stop telling everyone about this great event. I look forward to seeing many of you in the future. Thanks again. To the Three Musketeers of OBBQFOT, you exemplify the motto "One for all, all for one." Your tirerless efforts these past few months climaxed in a great event this past weekend. Your efforts are truly praiseworthy. To my friends of the CBBQA, you exemplify the Marine Corps motto, " Gung Ho," meaning to work in harmony. Your tireless work was sincerely noteworthy. To the businesses and individuals donating products and monies. Your contributions was generous and charitable. Thank You! To the other organizations, your participation was appreciated. Very much. AKA Can You Imagine Kicking a 70 Yard Field Goal? 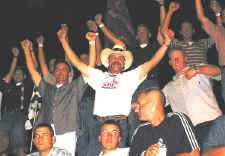 The Welcome Home Party for the Marines at Twentynine Palms was the most amazing event in which I have ever participated. Imagine a field the size of 2 football fields side-by-side filled with Marines who fought in Iraq surrounded by their friends and family members. Imagine the sight of the "Undisputable Cuz", the World's Largest BBQ Smoker, 78' long and 5' in diameter, not counting 3' foot walkways running down the length of the rig on each side. Nor does this include the fire engine red 9' cab in front which houses a big screen TV, phenomenal sound system and refrigeration storage and taps for beer, or the flaming red Peter Built that pulls it. Imagine 9 other smokers, a refrigeration truck filled with Kobe beef ribs, turkey legs, chicken legs and breasts, brisket, pork butts, Villa Roma sausages, Johnsonville smoked brats, hot dogs, coleslaw, potato salad and macaroni salad. Picture a Wonder Bread delivery truck filled to the brim with rolls and buns. Imagine a professional portable performing stage with lights and sound equipment and a large viewing screen, typically seen as sporting events, showing the performers live for those that can't get close enough to the stage to see. 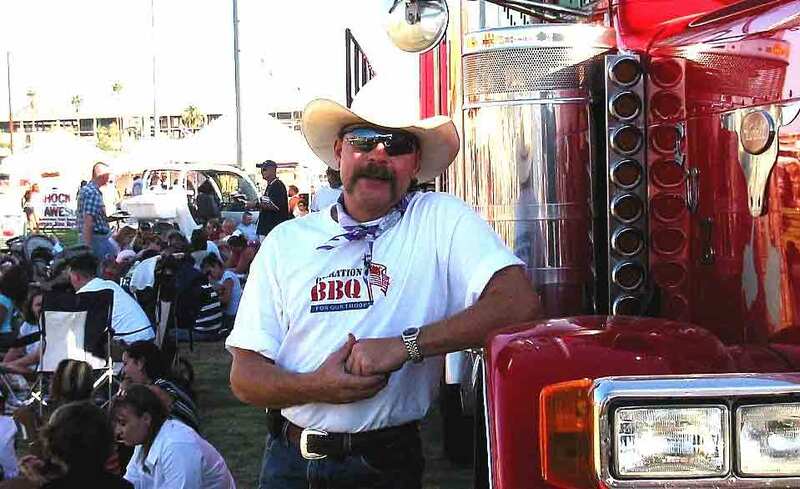 Imagine 50 BBQ experts, some members of the CBBQA along with other BBQ Association members, such as Arlie Bragg, who came from as far away as Tennessee, cooking and working together. Cooking started on Friday evening as butts and briskets went into the smokers. Saturday morning dawned clear and hot. Our crew of OBBQFOT volunteers, helped by a team of ROTC students and some VFW volunteers, rubbed chicken and turkey, pulled, chopped, sliced and sauced pork butts and brisket. 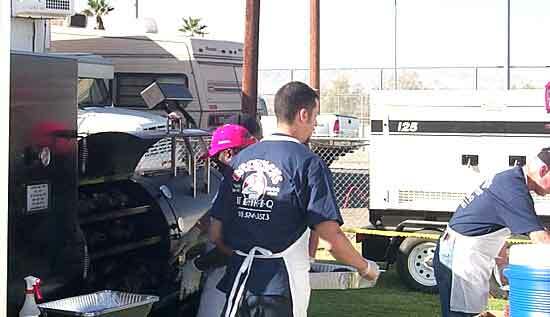 The meat pulling, chopping and saucing teams worked from about 10:30 Saturday morning until long after dark fell. The teamwork of the people attending was incredible! Bill Wight headed up the organization of the event with the help of Del King and Don Grissom. After seeing the months of emails back and forth of lining up volunteers, cooking equipment, of companies donating products like Coleman Meats, Edward's Pies, Smart & Final, Villa Roma Sausages, Johnsonville Brats, Unistar Foods, Hormel, Broadleaf Game, and so many more. To experience the flawless execution of the efforts is too much to put into words. Everywhere you looked, you saw all these volunteers working together, doing whatever needed to be done to make sure the event was a success. And it was a success! Saturday morning, headed up by the guidance of Dr. Don Iverson, Ruth and Doug Dennin and others chopped and cut fresh fruit and peppers, cilantro and more for the outstanding eggs Dr. Don prepared. 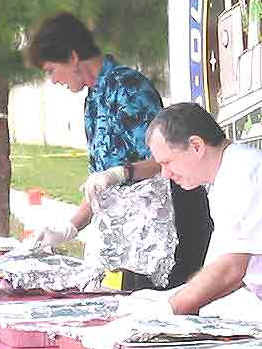 Pete Weaver and Pam Gram cooked bacon and heated tortillas to round out the morning's breakfast. I don't know where I have seen so many people working so hard all day to make sure everything was in order for the food service. It seemed every time I turned around I saw Ruth and Doug Dennin helping in a different area, but never stopping to take a break. 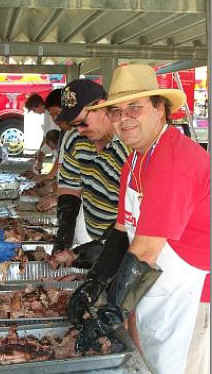 Mike Guinaugh and Dan Cannon organized pulling the cooked meats off the Cuz in the afternoon while Tom Chilton and Phillip helped Dan Drogichen organized trays of prepped foods for disbursement during the actual feeding process which went back into the Cuz to stay warm until dinner time. We started serving dinner at 4:30 PM and was supposed to continue until 7:00. 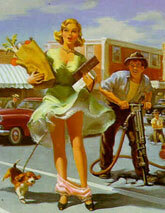 Bill Wight said, no, we will serve until we run out of food or we run out of Marines to feed. Runners came up to Dan and Tom, who were on the rig handing down the serving trays of whatever meats that were being requested to be taken out to the food lines. These trays were replacing empty trays as the Marines and family indulged in the BBQ feast before them. There were 5 lines that stretched almost across the entire field with the Marines and families. Just when the lines would shorten up, another wave of hungry people would again stretch back across the field. We finally ran out of Marines to feed about 10:00 PM. But it was not over, as Dan Cannon squirreled away a full pan of leftover pulled pork in his cooker and he gave it out to Marines who missed the party but came by late looking for some barbecue. The Marines gathered around the cooking pits asking questions about the rigs and the barbecue cooking processes. Most noteworthy was, of course, the Undisputable Cuz. Not just because of the shear size of the rig not because of the shinny red paint, but the owner, Bud Liffick, has a heart to match his rig. Before leaving on his journey to California on Sunday, Saturday Bud held an auction to help raise the transportation costs it would take to get the Cuz to California and back. Selling many of his own autographed Nascar items, like a Dale Earnhardt signed jacket to NFL signed footballs and jerseys. Bud indicated he raised enough money to defer his out of pocket expenses. 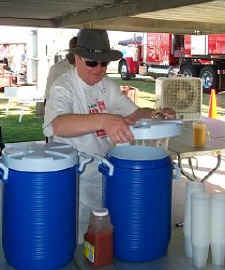 Also at the event were competition Chili teams from the ICS, a Budweiser sponsored beer truck which sold beer for a dollar a cup, and tents which had been set up for people to eat under the shade in the late afternoon sun. Of course a large portion of the grass area was filled with blankets stretched out as people picnicked on the grass when table seating ran out. As tired as we all were, I can honestly say at least for myself, that this was one of the most wonderful times I have ever had. I don't know of any other time I have gotten together with so many wonderful people all working together to accomplish so much. I want to thank Bill Wight for providing all of us with this awesome opportunity. Didn't get to read Susan's e-mail below until this morning. Yes Susan, Bud and The Undisputable Cuz did get into California and did a GREAT job in helping cook for the Marines and their families. Bud was great and stayed up all Friday night until about 6 am Saturday cooking. With your help we were able to feed about 7,500 Marines and family members (we acutally dished out 11,000 + plates of BBQ). Bud and The Undisputable Cuz were the visual center of the event. Bud spent a lot of time with the Marines and their families posing for pictures, answering their questions and generally making each of the Marines and their family members feel special... and he did this after cooking all night. Bud's 'da Man and The Undisputable Cuz is 'da Pit. Please thank everyone at Zacky for their generous donation of those great Zacky Turkey Drum Sticks. The 8,000 + returning Marines from Iraq and their families really enjoyed them at the September 20th Operation BBQ For Our Troops Welcome Home BBQ we did for the Marines at their base in Twentynine Palms, California. We served over 11,000 plates of BBQ (some of the Marines came back for 2nds and 3rds). The Zacky Turkey Drum Sticks were a BIG hit. Debbie, thank you and Zacky Farms for helping the Marines truly feel welcomed home, that was the mission of Operation BBQ For Our Troops and it was accomplished with the help of Zacky Farms. Jeff e-mailed the below to me (Don Grissom) but addressed it I believe to Bill Wight. I'm copying Bill and the OBBQFOT and California BBQ Association e-mail lists as I want them all to know how generous you and your associates at Restaurant Depot/Van Nuys and Risvolds were with your salad donations for the September 20th OBBQFOT Welcome Home BBQ we just completed for the Marines returning from Iraq and their families. Your salads really were a big hit with the Marines and their families. We didn't have any other side dishes so your salads really made it a complete meal for them. We served 11,000 plates of BBQ and your salads to some very grateful folks. Glad Jeff made it to the event, missed you there, I'll see you in a few when I'm at the Van Nuys Restaurant Depot store to shake yours and Armando's hands. Proud to know 'ya. 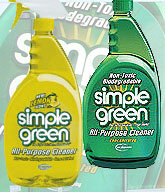 Please forward this to Tim Brandon, C.E.O. of Risvolds with ours and the Marines & their families thank yous for stepping up and helping to make the Marines truly feel welcomed home which was the objective. 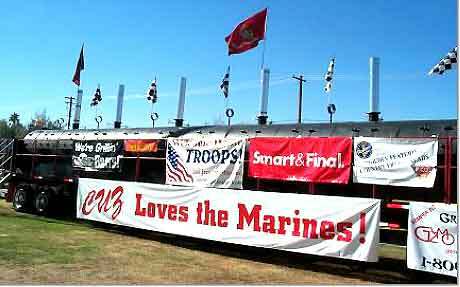 Want to take a moment to acknowledge the sponsors that said "Yes, how can we help" when called upon to support the September 20, 2003 Operation BBQ For Our Troops (OBBQFOT) event we did this past weekend at the Marine Base at Twentynine Palms, California. Also want to acknowlege the efforts of Arlie Bragg. Got lucky with Arlie. Arlie reached out and found us Ben Larimer of Mr. Micah's Grubbin' BBQ Sauce, Big Bob Gibson's, and Country Bob's which all came through with sauces and rubs. Arlie and his wife Joyce also flew out from Tennessee to help us cook for the Marines and Ben Larimer drove down from Northern California to also help cook! The Welcome Home BBQ provided by OBBQFOT for the U.S. Marines returning from Iraq and their families was a BIG success and couldn't have happened with out you. You and your companies provided the meats, sauces, rubs, wood, charcoal, salads and the world's largest BBQ pit which helped feed 8,000 + returning Marines and their families. We actually served over 11,000 plates of authentic wood smoked BBQ with some great salads. You and your companies made the mission/objective of OBBQFOT happen... make them feel welcomed home. When the Marines and their families left the BBQ they were full of good food and definitely felt welcomed home. You all did great for our troops. Click on http://www.shutterfly.com/osi.jsp?i=67b0de21b32cd13ce415 to see some photos of the results of your donations. * Note, there were other sponsors which also helped which other OBBQFOT Volunteers contacted and those Volunteers will follow-up with Smart & Final, Coleman Meats, BBQ'n Fools, Todd's Out of This World BBQ Products and any others and let them know they did great and were truly appreciated. Subject: Thank You Sponsors of OBBQFOT Sept. 20th Welcome Home BBQ For Returning Marines & Families!! 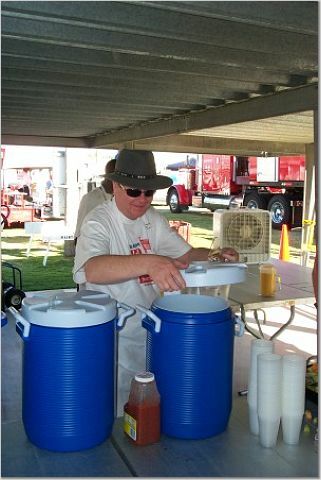 Dan Cannon, one of our most experienced pit masters at the event has put together a nice collection of comments and photos by the OBBQFOT Volunteers, you can see it at http://bbqdan.com/events/operation_bbq_troops/29_palms_092303/stories_all.html . Great job Dan! Ramada Express: Sean Hammond contributed a bunch of $'s to the MCCA for the event. 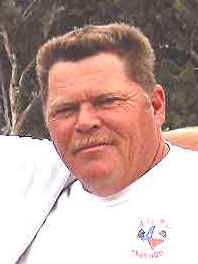 Hawgeyes BBQ: Mike Tucker was also quite generous and was the very first to donate $'s to MCCA and got the ball rolling and encouraged others within the BBQ community to also help. Virtual Weber: Chris Allingham made a generous donation to MCCA and encouraged visitors to his Virtual Weber web site at http://www.virtualweberbullet.com/ do also help. 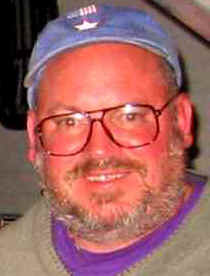 Jack Daniels/Brown Foreman: Tana Shupe got the ball rolling within Brown Foreman (parent of J.D.) and enlisted Billy Campbell to send a very generous donation to MCCA. They were ready to deliver some J.D. but the Marines wanted to keep it dry (what a darn shame!!). The companies and individuals listed above and below is not a complete list of those that donated to help the Marines and their families at the September 20, 2003 Operation BBQ For Our Troops (OBBQFOT) event we did this past weekend at the Marine Base at Twentynine Palms, California. They are the companies and individuals I made contact with. I do not have all the names of those that donated nor all the e-mail addresses. I'm hoping those other OBBQFOT Volunteers that contacted these other companies will reach out and let them know how much their contributions meant to the Marines and their families. I know Frank Boyer contacted Lazzari Fuel and they donated a bunch of their lump Mesquite Charcoal, I hope Frank will covey everyone's appreciation to the fine folks at Lazzari. Thanks for your post below. 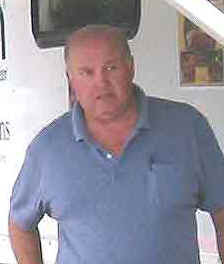 "* Note, there were other sponsors which also helped which other OBBQFOT Volunteers contacted and those Volunteers will follow-up with Smart & Final, Coleman Meats, BBQ'n Fools, Todd's Out of This World BBQ Products and any others and let them know they did great and were truly appreciated." " The companies and individuals listed above and below is not a complete list of those that donated to help the Marines and their families at the September 20, 2003 Operation BBQ For Our Troops (OBBQFOT) event we did this past weekend at the Marine Base at Twentynine Palms, California. I know Frank Boyer contacted Lazzari Fuel and they donated a bunch of their lump Mesquite Charcoal, I hope Frank will covey everyone's appreciation to the fine folks at Lazzari." Frank, please follow-up with Lazzari Fuel and let them know how much their donation was appreciated by the Marines, their families and the cooks that had the pleasure of using their great charcoal. I know that this event would not have happened if it had not been for the Dedication of Bill Wight. He had no reason to do this except for his love of country and to honor those that serve it. So many of the BBQ'ers that was out there were there for the same reasons. My thanks to you also. For me it was going home to take care of my Family, Once A Marine Always A Marine. That all of you did is so much more honorable than what I did, or why I was there. I came from a time when it was more common to be spit on than to be told welcome home. You made these Marines feel and know that there are Americans out there that really care. THANK YOU. There is an open invitation to all who helped. If you are ever in the area. Stop by 1st Tank Battalion. You will be greeted with open arms and treated like family for they now consider you one and all members of their community. The Commanding Officer will arrange a tour of the Tank facility for you. they would start to hide when they say me coming just knowing I was going to ask got room for more chicken or anything else. But no matter who I asked they always said yes no matter how tired they really were. When the ladies were not chopping pork they were in another line rubbing the chicken putting it in pans to fill the next pit. When the cooks were manning their hot pits they would take a break to form a line to unload the next 10 cases of chicken, and then the next 10 case. that certain item that was needed. The whole time we were serving the stood their post and never left it just so we could keep the serving lines full of the needed meats. It doesn't matter what the job was that anyone did big or small they did what the could. I saw so many people give 150%. We prepped, rubbed, cooked, chopped, sliced, and served about 5 tons of meat yesterday. At the end, we had some chicken we didn't cook and a few pans of pulled pork left. 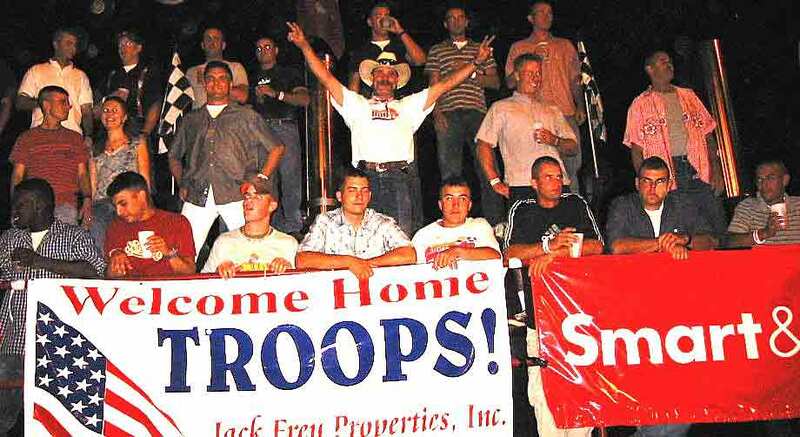 All the rest was eaten by Marines and their families at an absolutely incredible Welcome Home Party. Everything was bigger than I thought it would be - the stage, the giant screen, the amount of people, -- the CUZ. That thing is awesome. I'm really proud of the BBQ'ers and how everybody worked together to make this such a huge success. They started serving the food at 4:30 and stopped a little after 10:00 pm. It was a huge undertaking, and I know everybody is tired, but it was worth it to show appreciation for the Marines and their service. It would be tough to beat Billy Nicola and Joe Miles in the hot work dept. - they were working Billy's grill out in the mid-day sun. As Carl said, everybody worked their Boston's off, but it was worth it. The Long Beach ROTC students were like machines. We should think up a way to acknowledge them with a plaque or something - the VFW guys too. I wrote something of what I observed. Feel free to use whatever you feel is appropriate for an "overview" type article. That was a really fantastic event. Hi Bill - here are some things I saw at the event. Hopefully you can use them to write a story as Don Grissom suggested. I arrived about 7:30 p.m. on Friday. People had already started trimming brisket and were just forming a "bucket brigade" to unload the pork and put it on the "Undisputable CUZ." The teamwork was what really impressed me - everyone was pitching it to do whatever was necessary to make the event a success. Next, we had dinner cooked by John and Linda Burke, which was very delicious and really hit the spot. After that, people went back to prepping for putting the meat on the "CUZ" and getting ready for the next day. Phillip and I left around 11:00 pm on Friday to go to the Marine Hotel, which the MCCS graciously provided. We got back around 7:00 the next morning, and Pam Gram and her crew were getting breakfast ready. After that, we started prepping Kobe beef ribs, chicken, turkey legs and then the meat started coming off the CUZ and we were pulling, slicing and chopping that. After we processed the meat into its final form (chopped, pulled, sliced and sauced) and put back into pans, we put them back into the CUZ, which had now become a giant warming oven. Mike (don't know his last name - he had a white beard and a straw hat on) took the first shift on replacing the meat into the CUZ warming oven, then Dan D. (from San Diego, don't know his last name either) did a Herculean job of organizing all the pans in the CUZ and labeling them so they'd be available for service right away. 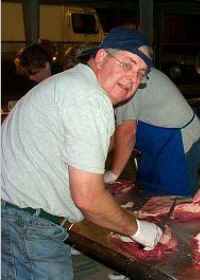 When service began, I started helping Dan D. on the CUZ getting the meat out for the runners. The first thing we ran out of was Kobe beef ribs, next was turkey legs, then hot dogs, chicken breasts (we did get more of these as they came off the pits), brisket, sausage, and eventually around 9:30 all we had left was pulled pork. When the runners would come, they would ask for beef ribs, so we'd tell them - no beef ribs, Cheeseburger, Cheeseburger, Cheeseburger (or Pork, Pork, Pork) - we thought it was funny at the time, but we were probably delirious from the heat. Being on the catwalk of the CUZ, we could hear all through the afternoon and evening the cleavers of the pork choppers pounding away. They literally never stopped pulling pork. The stalwart of that group was Ruth Dennin. Toward the end of the serving time (maybe around 9:45), Dan Cannon took a pan of pork over to the ICS Chili cooks in the cooking area next to us. They returned the favor and brought us the ingredients for "chili boats" - Fritos, chili, cheese, and chopped onions. As you'd expect, the chili was top notch, and really hit the spot after a day when the only food after breakfast was morsels of pork or brisket. 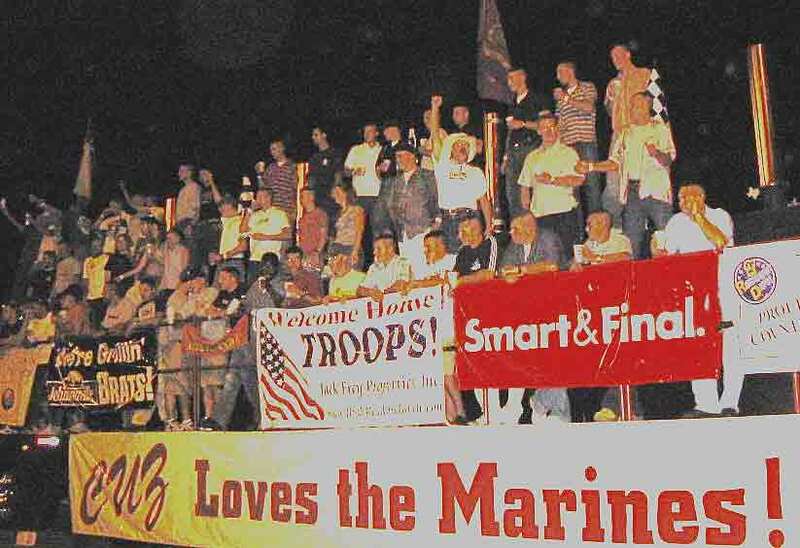 At one point, the CUZ was "invaded" from the other side as a large group of Marines (and Bud L.___ the owner of the CUZ) stood on top of it for a group picture. I did look around at the crowd several times, and noticed thousands of happy Marines and their families enjoying real hardwood-smoked BBQ, which made everything we were doing more than worth it. Several Marines who were interested in BBQ checked out the CUZ, looked inside. They all thought it was incredible. One Marine had a Georgia Bulldogs T-shirt and hat on and said it was the best BBQ he's had since leaving home. Another guy couldn't believe that the whole unit was heated by the firebox at the end. After it was over, we were tired, but very happy that we had shown our appreciation to the Marines for their service. It would be tough to beat Billy Nicola and Joe Miles in the hot work dept. - they were working Billy's grill out in the mid-day sun. As Carl said, everybody worked their Bostons off, but it was worth it. The Long Beach ROTC students were like machines. We should think up a way to acknowledge them with a plaque or something - the VFW guys too. Does anyone have a way to get in touch with the Southern California VFW people? I'd like to thank them personally for their help. They comprised about 1/2 of the servers, and I don't know how we would have made it without them, as we were stretched pretty thin with the food prep and running and all. It's unfair to single anyone out, as everyone was constantly working for at least about 12 hours, but in the hot work department, I was impressed how John Richardson kept the food trays full, and how Tom Chilton and Dan Drogichen kept the food going into and out the Cuz all day. Still, you count it all up, we served a hell of a lot of meat. I don't know what the final body count was, and I really think it would be tough to provide one, since people were drifting in and out. But we did serve more food than I ever have ... by a factor of about 10. Hey guys Ben here from Mr. Micah's Grubbin' BBQ Sauce. Just wanted to take a minute and tell each and everyone of you how much I enjoyed being a part of Operation Bbq! It was great to make new friends that I know I will someday see again. As I am new to the association , I can only imagine the great events and cook offs to come. I look forward to working with all of you again, and am glad to be the CBBQA Spark Plug for Northern California! You guys are all a class act. If you ever need anything please don't hesitate to ask! Make sure to look for our sauce next year (early spring ) in a Vons or Safeway near you! Oh yeah can we get a sanctioned Cook off up here in Northern Cal? One More thing GO SOONERS! We have had reports back about how Saturday went...they have been great. I'm just sorry we weren't there for the final fulfillment. God, how we have learned to love Marines over the years that we have lived in this area. The couple that we invited to Friday's dinner was a retired Sgt. 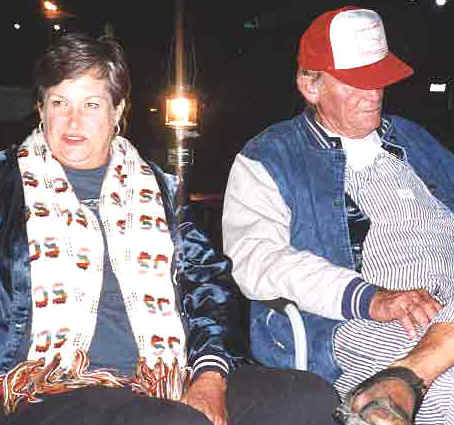 Major and his wife...we did his retirement party a couple of years ago. Of course, the powers that be on base wouldn't let him go, so he's still there in a civilian capacity. (They were the ones helping out with our serving...maybe we have some budding BBQers?) Truly, every time we serve Marines, we are more impressed with the quality of the men that serve US. They call us "m'am" and "sir" and we always feel it should be reversed. We love these guys. As newcomers to the group, though, Ann and I want to thank you for the great time working our butts off with you all to make something good happen, a roaring success by any measure, and for all the memories we'll keep of this event. What particularly impressed me was the depth of leadership, civility, and camaraderie in this group, which is what really made it work. It seems like there were a dozen people who knew what needed to be done, and were willing and able to make decisions effectively and quickly when needed. But I didn't see a single argument when Bill or Del said to do something. I never heard a raised voice all day, despite the heat and hurry. Maybe you're all used to that, but it's not always the case for a bunch of volunteers that don't see each other daily, and individually regard themselves as experts, working under stress. Like all the rest of you I was working harder than anyone could pay me to, but I never felt like my time or effort was being wasted, and that made it fun. Thanks. Hope we can do it again some time.